Photo of recovered aritfact seized from smugglers by Asayish forces. Source: The Authority of Tourism and Protection Antiquities. According to SANA archaeological remains in the historic area around Yabroud have been looted and damaged. You can learn more at SANA. The Department of Antiquities in the Syrian province of Daraa recovered more than a hundred historical pieces stolen from the town of Bosra. Read more on this on the DGAM website, and in Prensa Latina. 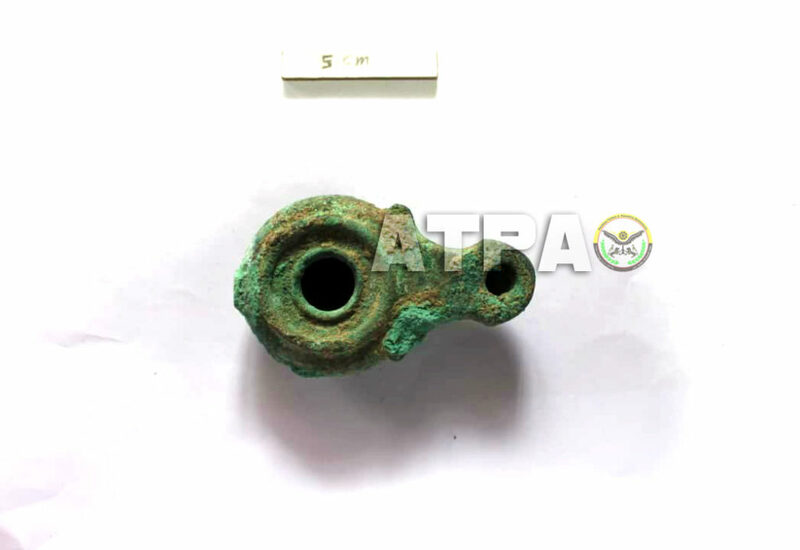 The Authority of Tourism and Protection Antiquities in Al-Jazira territory documented the collection of pieces seized by the Asayish forces from smugglers of antiquities. Among these items are coins and pottery. To learn more go to the ATPA website. Live Science reports that some looters are turning to ‘Jinn’ spirits in their hunt for treasure, using examples of looters in Syria, and citing research into looting motivations by Heritage for Peace’s Isber Sabrine. You can read more on Live Science. The traditional Syrian art of shadow play has been inscribed on the UNESCO list of Intangible Cultural Heritage in Need of Urgent Safeguarding. Read more on the UNESCO website. SANA reports that the ancient Bosra al-Sham city in Daraa province has restored its historic splendor and started to receive visitors again after years of hiatus. Learn more at the Syria Times. The joint Syrian-Hungarian archaeological expedition resumed its work insulating the church roof to protect ancient murals at Krak des Chevaliers castle in Homs. Learn more about this project at SANA. In Raqqa, one family is rebuilding the city’s heritage by producing historically accurate bricks, churning the clay by foot and baking the bricks in a kiln. You can learn more on Rudaw. Syrian academic Al-Hakam Shaar is working on a project envisaging the eventual rebuilding of Aleppo. You can read more on this at the UNHCR. Esmat Zain al-Deen turned his guest house into a little museum after collecting 2,500 pieces of antiquities from the Sweida region where he is from, driven by his love of his ancestors. Learn more by going to New China. The “Sculpture 1” exhibition at the Qozah Art Gallery in Damascus explores the evolution of Sculpture art in Syria. Learn more about this on SANA. The week-long ‘Culture Day’ in Syria celebrated the culture and history of Syria with fine arts and sculpture exhibitions, concerts, a book fair, theatrical shows, musical performances and a hand craft exhibition. You can read more at the Syria Times. The Authority of Tourism and Protection Antiquities in Al-Jazira transferred the remainder of the contents of mission houses operating in Al-Jazira to safe warehouses. The second step is supplying the warehouses with metal shelves and replacing worn-out boxes with plastic boxes in preparation for their count. Read more on this here. Inspired by damage to Palmyra, a geomorphologist is spearheading an initiative to quantify and catalog the impacts of bullets in rock at heritage sites to ultimately develop step-by-step guidelines for locals to identify and catalog ballistic damage. Learn more on the Nature website. Brian Daniels of the Penn Cultural Heritage Center and Smithsonian Cultural Rescue Initiative recently spoke at the Archaeological Heritage Network about the Safeguarding the Heritage of Syria and Iraq Project t the Cultural Heritage in Crisis Conference in 2018 in Berlin. Watch the recording on YouTube. A Syrian archaeologist representing the Syrian Culture Ministry pleaded for international help for the preservation of Syria’s cultural treasures during the Thessaloniki Conference. Read more on the Greek City Times. “The Charter for the Protection of the Byzantine Heritage Monuments” was unanimously ratified and will be submitted to UNESCO. The charter establishes a framework of principles for the protection of Byzantine heritage for all areas comprising the former Byzantine Empire. You can read more on this on the Greek Reporter. A new exhibition in Doha celebrates Syria’s artistic history and cultural heritage. Learn more on Al-Jazeera. A small version of the famous Souq Al Hamediya, the biggest souq in Syria situated in Damascus, has been set up at the museum of Islamic Art (MIA) Park on the sidelines of ‘Syria Matters’ exhibition in celebration of MIA’s 10th anniversary. Read more about this here. The “Syria Under the French Mandate: 1918-1946” exhibition at the Qatar National Library explores how political events during the French Mandate in Syria affected the country’s cultural heritage. Read more on the Al Bawaba website. The inaugural exhibition at the private Nabu Museum in Lebanon includes hundreds of antiquities from Syria and other countries. Learn more at the Star2 website. The “Cities Millenaires: Virtual journey from Palmyra to Mosul” exhibit at the Institut du Monde Arabe looks at four major heritage sites including the Old City of Aleppo and Palmyra. A second exhibition at the Cite de l’architecture examines the history and current condition of the Krak des Chevaliers heritage site. Read more on the Ahram website. An exhibition in Dubai celebrates the traditional art of painting, featuring paintings and a sculpture by Syrian artists. You can see more on the Gulf News website. SANA reported that the Czech Bravo Newspaper recently published a photo-report about Palmyra while the National Museum in Prague is rehabilitating archaeological pieces from the site. Learn more about this on SANA. The Wisconsin Muslim Journal published a collection of photographs from “Legacy in Stone: Syria Before War,” 100 black-and-white photographs of Syria’s ancient monuments. The Arab News reported here on the second-century Roman theater, a UNESCO World Heritage Site in Bosra. Today published a video featuring ASOR CHI Co-Director of The Day After Heritage Protection Initiative (TDA-HPI) Amir Al-Azm discussing efforts to save Syria’s history, including efforts at the Al Ma’ara Museum. Philly.com reported on Syrians leading tours at the Penn Museum, where the Middle East Galleries displayed 1,200 antiquities spanning Millennia. Financial Times reported here on the ongoing Syria Matters exhibition in Doha (behind a subscription paywall). Historian Mahmoud al-Sayyed of the General Directorate of Archaeology and Museums recently explained Syria’s archaeological history and ancient past.Learn more about this on SANA. SANA reported on the unique architectural style of traditional Damascene houses and buildings, arguing that they deserve UNESCO World Heritage Site status. More information and photos are available on SANA‘s website.